Only a handful of people get to achieve everlasting fame and still fewer maintain a large number of followers long after their death, yet Genghis Khan has managed to go above and beyond even that. To the Mongolian people, he is regarded as a godlike figure. The religion surrounding him has deep ties with Mongolian shamanism and has managed to sustain its popularity over centuries. He is often equated with Tenger or “the Sky-Father”, the chief deity of an ancient Turkic religion known as Tengrism, and it is believed that his ideals were the founding principles of the Yuan Dynasty (1271-1368). 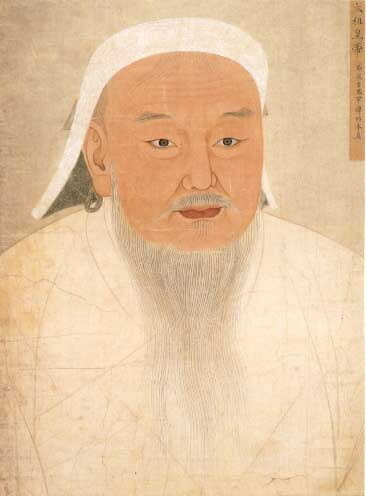 Not content to be just another picture in a dusty history book, Genghis Khan’s exploits have managed to make him a god! 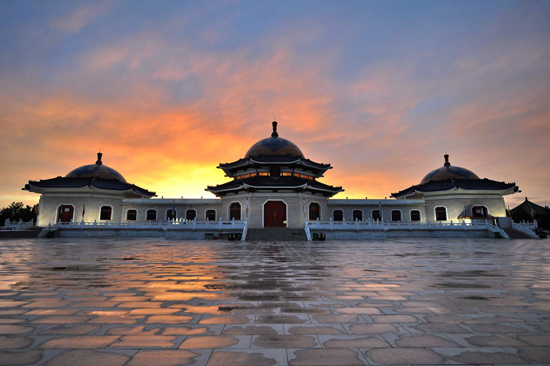 Inner Mongolia and northern China, the Mausoleum of Genghis Khan is arguably the grandest. It is located in Xinjie Town near Ordos City and is a cenotaph, meaning it does not actually contain the remains of the mighty warrior himself. After Genghis Khan died, according to his will, he was carried to central Mongolia and buried without any markings. The actual location of his remains is still unknown but, instead of a burial mound, portable tombs known as the “eight white yurts” were erected in his honour. These yurts had originally been palaces where he had lived but were converted into mausoleums on his death. They were guarded by a Mongolian subgroup known as the Darkhads or “untouchables”, who were sacred shamans charged with his protection. So, when the Darkhads decided to move to Ordos, the mausoleums simply came with them! However, due to the disruption caused during the fall of the Qing Dynasty (1644-1912) and the Second World War, they had to be moved to the province of Gansu for several years. They suffered another upheaval in 1949 when they were moved to Qinghai province by the warlord Ma Bufang. In fact, in a desperate bid to protect them, the Kuomintang even hid them within a Buddhist monastery, twice! In 1956, they were replaced by the immovable mausoleum that can be found today and are still guarded by several Darkhads, who continue to carry out the rituals that have been passed down to them over 800 years. At least, as a Darkhad, you know you’ve always got a guaranteed job! The complex itself is made up of three large “palaces” or halls that are designed to resemble yurts. The Main Palace is set at the centre and is the largest of the three, towering in at 26 metres (85 ft.). Inside there rests a 5-metre-tall (16 ft.) statue of Genghis Khan made of white jade, resplendent in his armour with his characteristically fierce face. At over twice the size of the average basketball player, Genghis’ statuesque form cuts an imposing figure! Behind him there is a map of the vast territory he once controlled as part of the Mongol Empire, the largest contiguous empire in world history. Surrounding the statue are saddles, weapons, carts, and other relics believed to have belonged to him, although several of them are replicas. His empty coffin and coffins belonging to three of his wives are also housed within the Main Palace. Within the East Palace are interred the coffins of Genghis Khan’s fourth son, Tolui, along with his wife. Of all of Genghis’ sons, Tolui enjoys the most eminent status as he was the progenitor of many Mongolian kings, including Kublai Khan. After all, when your dad was so famous that he’s now regarded as a deity, you have to be a pretty high-achiever to even get noticed! The West Palace houses the nine banners and the Su Le Ding or “Iron Spearheads”. The nine banners symbolise the nine trustworthy generals who followed Genghis Khan and the iron spearheads were once part of the flags that he used to command his army during his many conquests. According to legend, his soul entered the spearheads on his death and still inhabits them, making them a sacred object among the Mongolian people. The corridors that connect the palaces are adorned with frescoes depicting scenes from Genghis Khan’s life and Kublai Khan’s establishment of the Yuan Dynasty. Special sacrificial ceremonies take place at the mausoleum four times annually, the grandest of which happens on March 21st according to the Chinese lunar calendar. On this day, Mongolian shamans engage in solemn rituals and pile whole roasted sheep before the statue of Genghis Khan. The intricate procedures that surround these ceremonies have remained virtually unchanged since the 13th century. After the main ceremony is complete and the visitors have made their personal offerings of flowers, food, and incense, competitions will take place, such as wrestling, horse-riding, archery, and singing. During these ceremonies, the mausoleum comes to life in a glorious display of traditional Mongolian culture. Kuomintang: Also known as the Chinese Nationalist Party. They were the ruling party from 1928 until their defeat at the hands of the Communists in 1949. They retreated to Taiwan, where they still play an active political role.